Children love identifying all the letters in their name. Use that as a jumping off point for further letter identification in words. Young children find everything about themselves interesting. Take advantage of this and use their names and those of individuals close to them as a starting point for identifying letters in words. 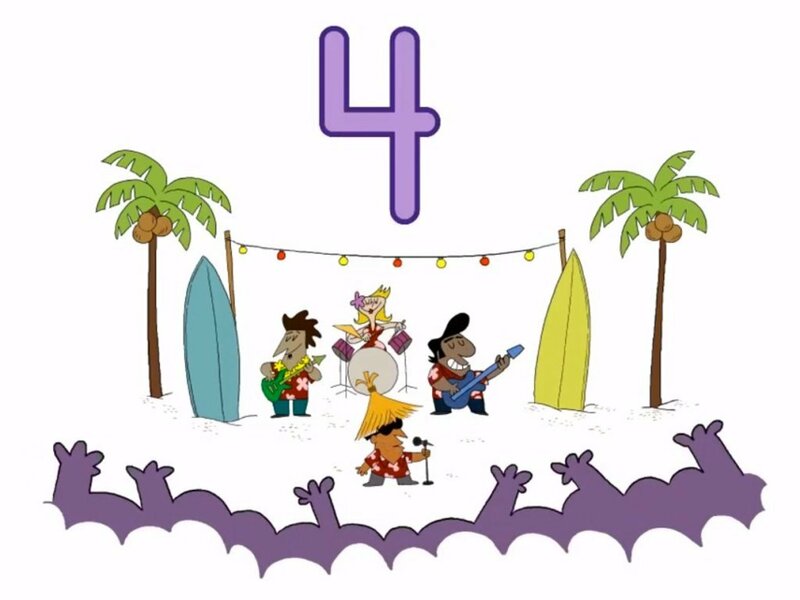 How many C's does the woodchuck have in his silly tongue twister? 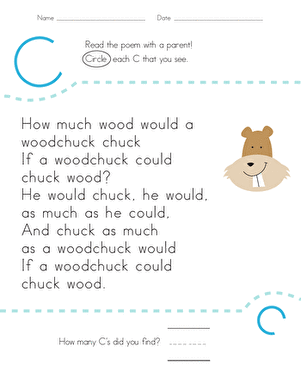 Kids find and count each letter C in the rhyme on this kindergarten reading worksheet. 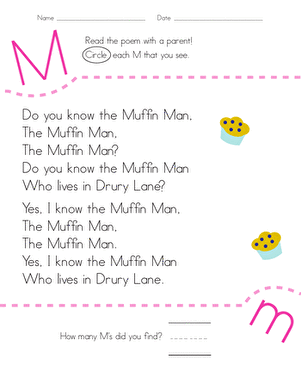 How many M's does the Muffin Man have in his nursery rhyme? 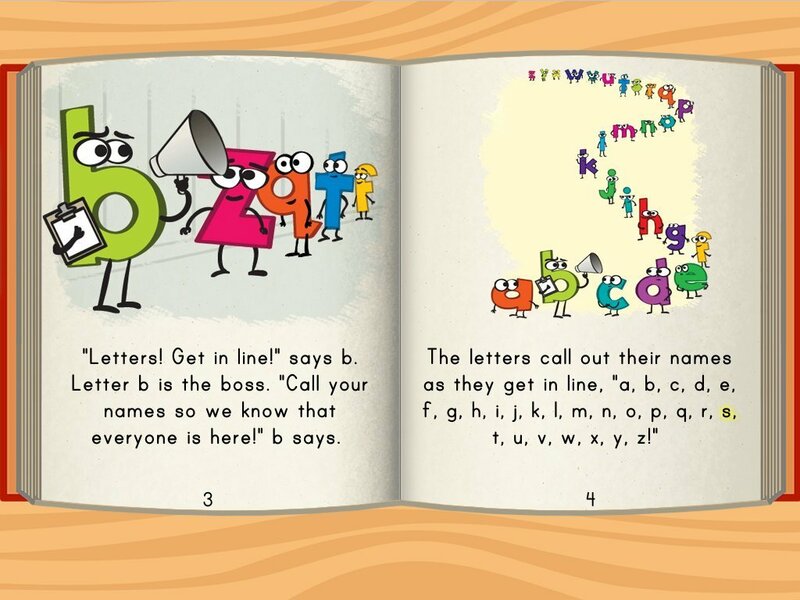 Kids find and count each letter M in the rhyme on this kindergarten reading worksheet. 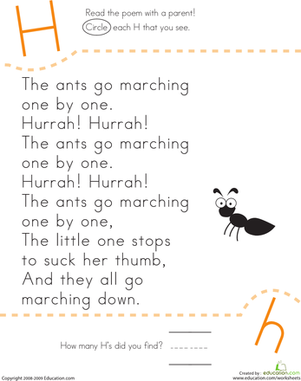 How many H's do the marching ants have in their "Ants Go Marching" song? Kids find and count each letter H in the song on this kindergarten reading worksheet. Picking words out can be tricky. 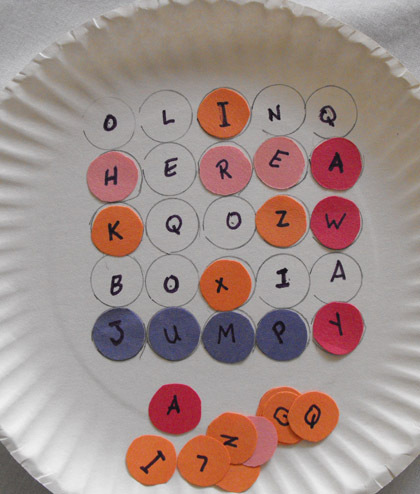 In this early reading activity, your child will place letter markers on a grid to make words appear out of the jumble. 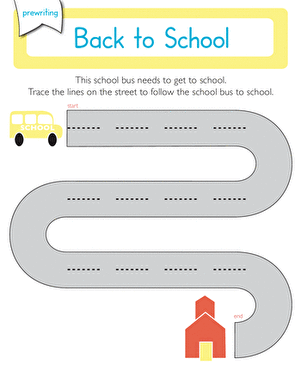 Ask your child to keep their eyes open for things that come in groups of six, seven, eight, nine, and ten. Ten fingers and ten toes for example. Students have 10 fingers and 10 toes, but what else comes in groups of 10? Can students find or think of anything else that comes in groups of six, seven, eight, or nine? 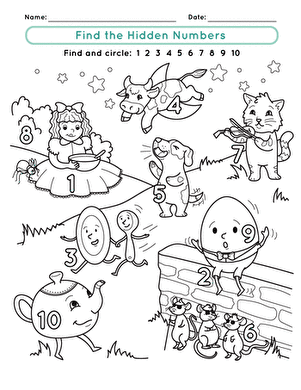 This preschool math and coloring worksheet focuses on the number 10. 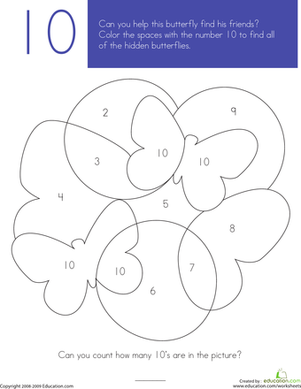 Kids color all of the spaces with the number 10 to reveal hidden butterflies. 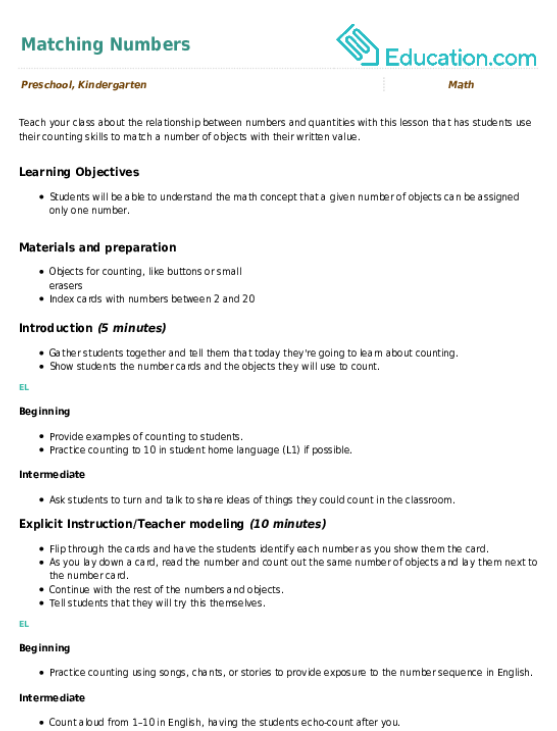 The idea of one-to-one correspondence, or how one object can correspond to one of another object, is important in both reading and math. 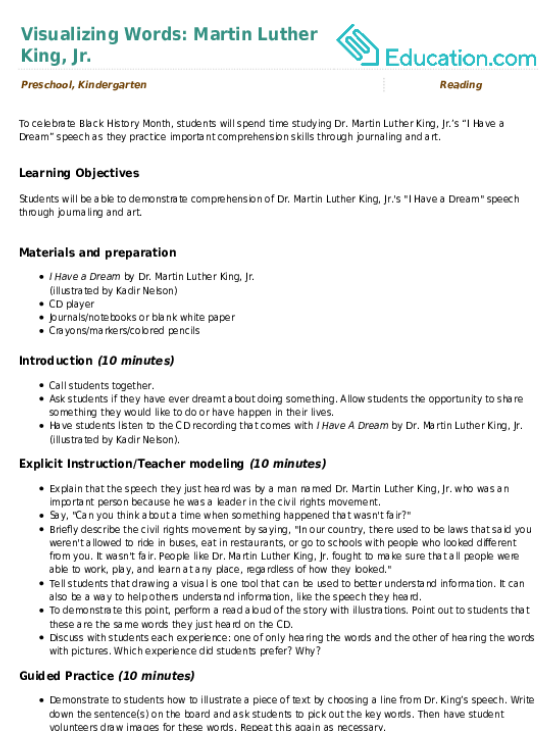 Pointing out the connections in both subjects can help the concept to stick. The idea of one-to-one correspondence is important in both reading and math. 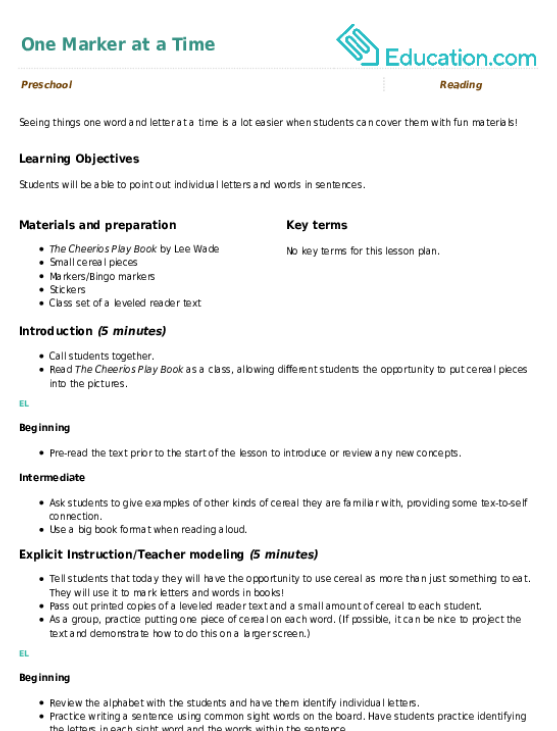 Pointing out the connections in both subjects can help the concept to stick. 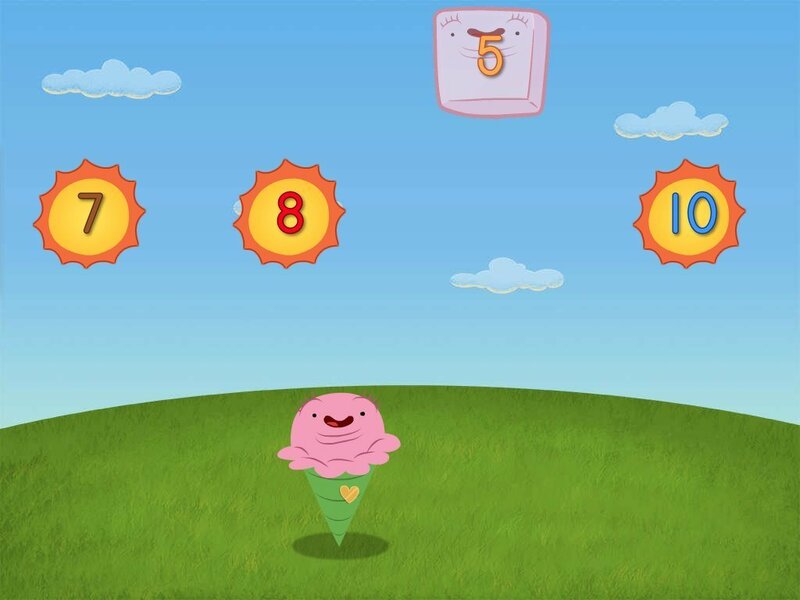 It's time to make tracking words more fun! 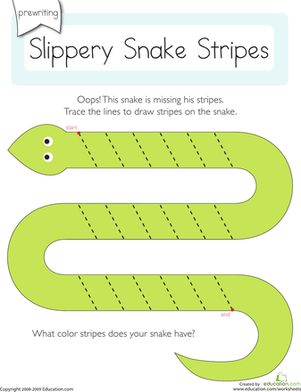 Students will have a blast pointing along with this colorful worksheet as they practice one-to-one correspondence. Codes, colors, and pointing will all help your young student to practice one-to-one correspondence in this interactive worksheet. Students will touch each color-coded word with a corresponding finger while an adult reads the story aloud. Matching up words in this worksheet will help your young student practice sight words, scissor skills, and one-to-one correspondence! Give your young student more practice with sight words, scissor skills, and one-to-one correspondence with this fun activity! 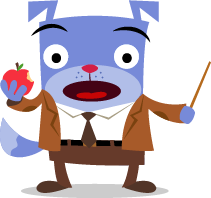 EL Support Lesson: Mark It! 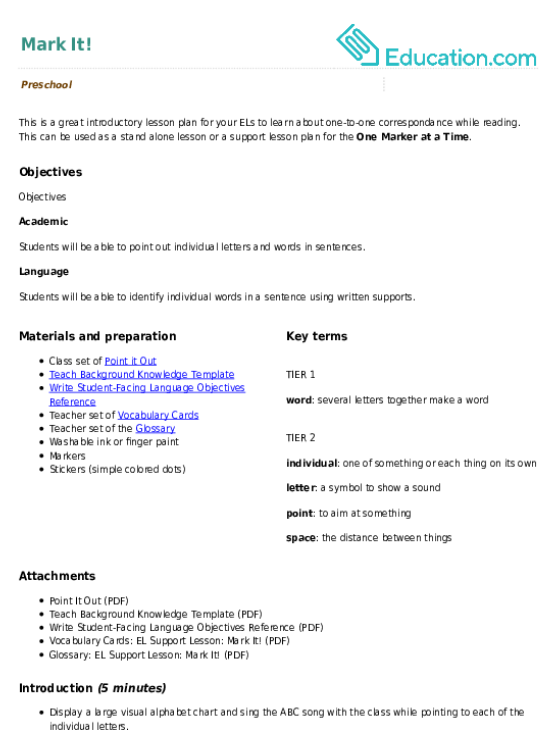 This is a great introductory lesson plan for your ELs to learn about one-to-one correspondance while reading. This can be used as a stand alone lesson or a support lesson plan for the **One Marker at a Time**. Long before a child can write words they can draw stories using symbols or signs. 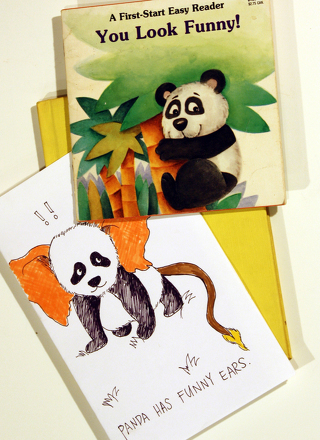 Writing words to accompany their drawings can get them interested in the writing process. 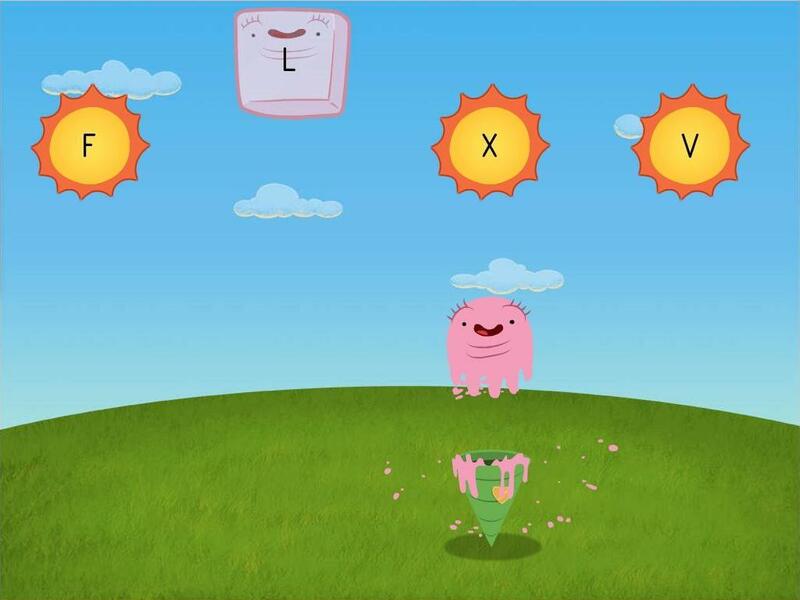 Long before students can write words they can draw stories using symbols or signs. 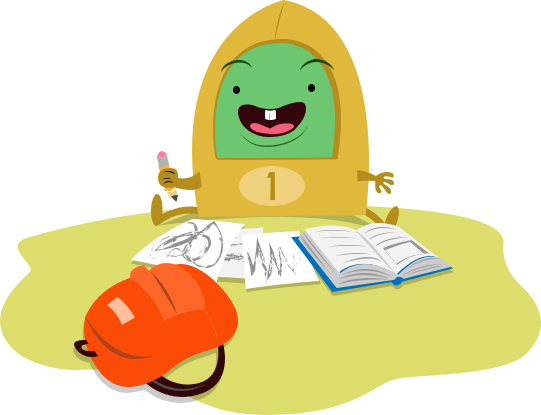 Providing transcriptions for their drawings can increase interest in the writing process. What lives at the bottom of the ocean? Whatever you want! Finish this picture by drawing whatever you imagine to be living near the ocean floor.